I’ve both spoken this phrase and responded to it–and, to this point in time, I’ve never been disappointed. The Cocktails and Canvas class at Alpine Arts Center last week was just another notch on the experience stick. I’m not an artist–my skills peaked in elementary school when I was able to somewhat recreate pictures of Garfield or Disney characters from coloring books without tracing. However, this marked lack of talent never stops me from wanting to be an artist. I figured that adding cocktails to the mix would only enhance my lack of natural ability. My chosen (wrangled) date was Ariadyn, who told her friend Kayla, who told her friend Merrill, providing that oh-so-important number of four: exactly the correct number of ladies to split a bottle of wine and behave responsibly. Our instructor, Amy, was very good at not only providing some technical tips without stifling the creative flow, but also keeping us on track time-wise. Otherwise, we might have been there all night, laughing and bemoaning our respective masterpieces. In short, we had a fabulous time. The energy was contagious and I appreciated the fact that though we all had the same “starting piece,” four different swirly trees emerged. 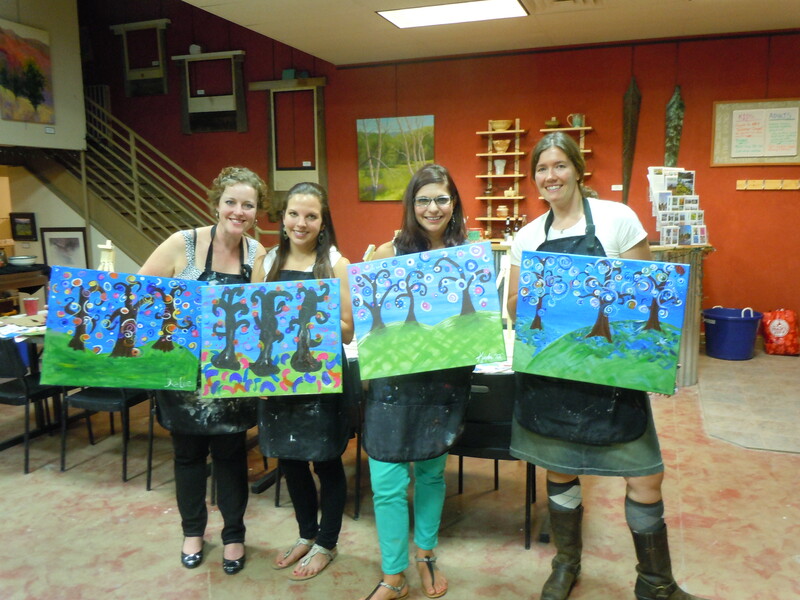 Watch out Picasso–there are some red-wine swilling ladies who are hot on your heels. You can take a look at upcoming classes and sign up for Cocktails and Canvas on the Alpine Arts Center website. The studio also has local art and jewelry for perusal and sale. Classes are $40, but we lucked into a “two for one deal” last week. The studio provides all materials including aprons, paint and canvas; wine and snacks are not included in the class price. As classes start at 6:30 p.m., we recommend heading over to Dish for their spectacular happy hour (5:30 p.m. – 6:30 p.m.) prior to class. The Alpine Arts Center is practically next door. If you’re hungry after the profusion of creativity, head over to the Gore Range Brewery for pizza and an excellent Bourbon Porter. This looks like fun. Love how yours turned out. Where are you going to hang this in your new place?